Amphiphysin antibody LS-C200124 is an unconjugated rabbit polyclonal antibody to Amphiphysin (AMPH) from human, mouse and rat. Validated for Peptide-ELISA and WB. AMPH Antibodyantibody detects endogenous levels of AMPH. 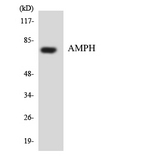 Western blot analysis of the lysates from HUVECcells using AMPH antibody.